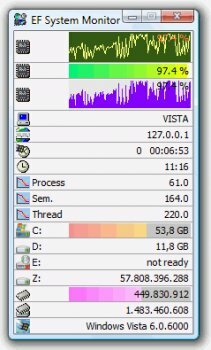 System Monitor is a comprehensive tool which provides you with information about all computers running on your network: memory space, hard disk usage, date, time, user name, etc. When you run it under Windows NT/2000/XP you can use the advanced sensors provided by Windows NT platforms: process and thread surveillance, advances IO ports monitoring, CPU times, etc. All items are displayed using suggestive graphical histograms and icons. It can collect and display the data from remote computers from a TCP/IP network.